As a child of the Pacific Northwest and growing up hunting the great public lands of Oregon, it’s safe to say Kristy Titus’ truest outdoor passion is elk hunting. And while she is offering her top 10 elk calling tips here, she is quick to point out there is no quick method of education for calling in that giant bull elk. However, she said, no two hunts – like no two elk – are ever exactly alike. 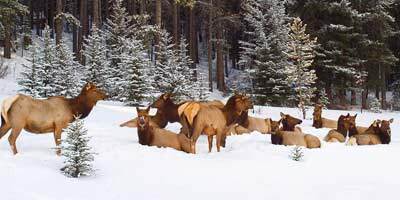 “Every elk is going to react differently,” Titus said. “Whether it’s because of the moon phase or the weather conditions or the herd’s mood … it’s always going to be different. “I try to tell people: There’s no right way, there’s no wrong way. You have to plan your hunt strategy off the information you have at the time. Hindsight is always 20/20. I believe that cow-calf communication is the best way to make the most of your time investment. And there are many hunts where I never bugle once. If that bull doesn’t like what he’s hearing, he’s picking up his cows and leaving. The key to any successful elk hunt is not calling, Titus said, but the wind and using it to your advantage. Titus has appeared on several outdoor television shows, and in 2010 hosted Lethal with Kristy Titus on the Pursuit Channel. Her website is pursuethewild.com. With some last-minute urging last year from her friend Rocky Jacobsen of Bugling Bull Game Calls – now Rocky Mountain Hunting Calls -- Titus entered the World Elk Calling Championships in Las Vegas with a borrowed bugle and a diaphragm new from the package. Even though she was a little rusty, as she had not picked up a bugle in several months, she took second place in the women’s open division. Titus said she uses Jacobsen’s calls exclusively. Titus said she recently returned to the mountains after the conclusion of Oregon’s archery elk season, simply to continue the ongoing process of honing her elk calling skills.